The latest issue of Tell Tales – August 2011 – is out now and available for download – just click here. Printed copies will be mailed out in the next few days. We want to get more ladies out on the water – particularly ladies races, which have unfortunately seen a poor turnout this winter. So we’d like to ask for your input please. We’d really appreciate it if you could take just a couple of minutes of your time to answer some quick questions about your participation in ladies racing. The survey is open to both men and women – we value all your opinions. The minutes from the June 2011 Committee meeting are now available for download here. 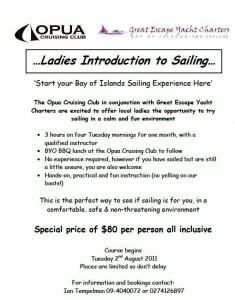 Opua Cruising Club has teamed up with Great Escape Yacht Charters to offer an amazing deal on ladies sailing tuition. Get 4 x 3-hour lessons for just $80 – a saving of 75% on normal tuition fees! 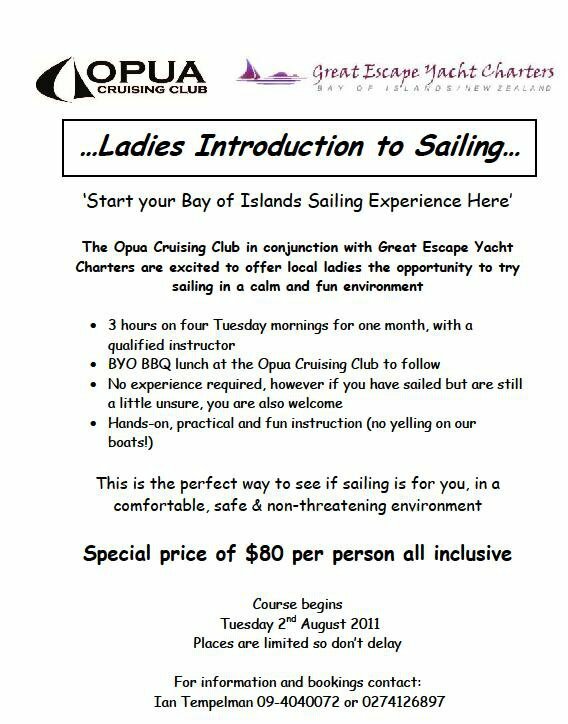 The course starts on Tuesday 2nd August and will run every Tuesday morning for a month.